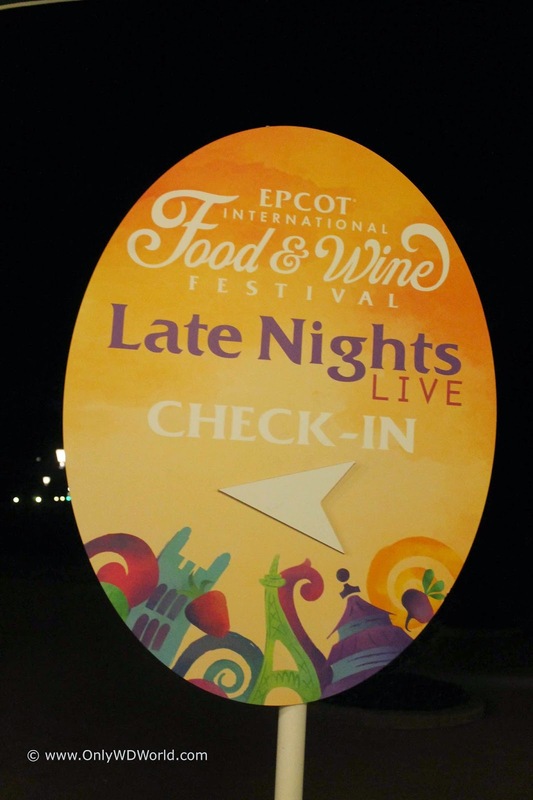 The newest Disney World Special Event added to the impressive 2014 Epcot International Food & Wine Festival lineup is called Late Nights Live! and we had the opportunity to attend the inaugural event on September 25th. 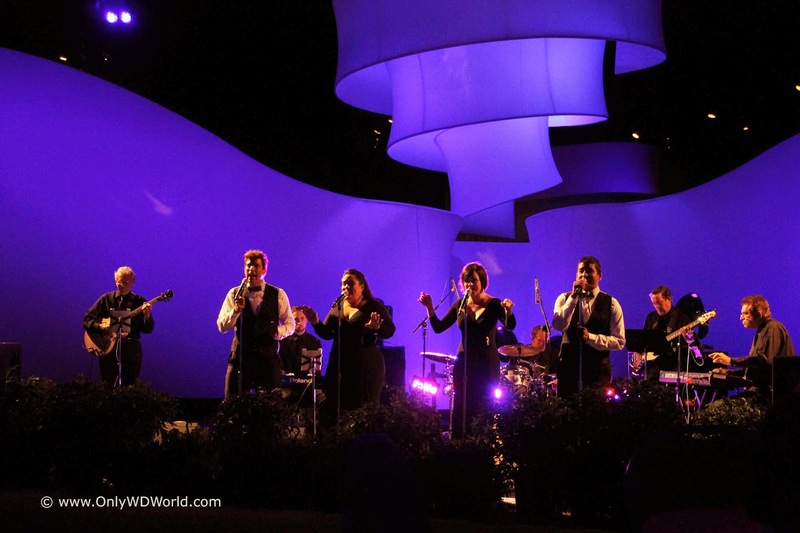 Held each Thursday night for the duration of the 2014 Epcot International Food & Wine Festival from 9:45 pm (after Park Closing) until 1:00 am Late Nights Live! 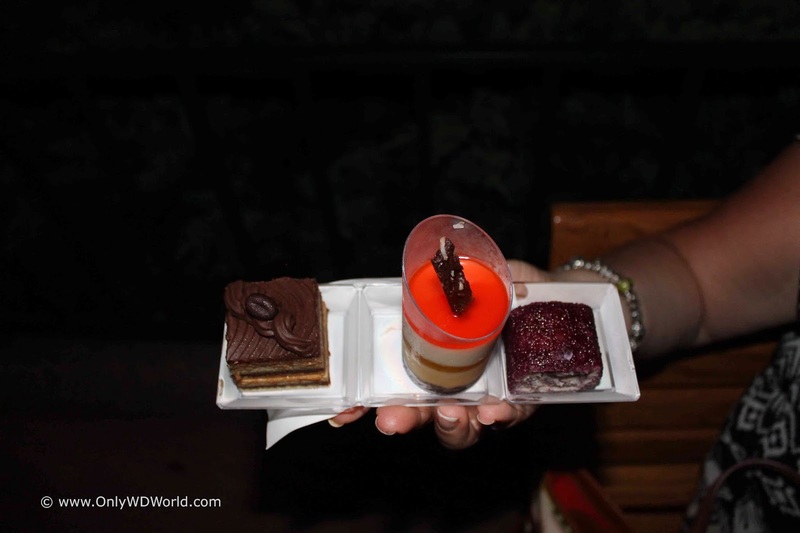 is a hard ticket Disney World Event ($79.00/per person) that provides a special way to experience the Food & Wine Festival. 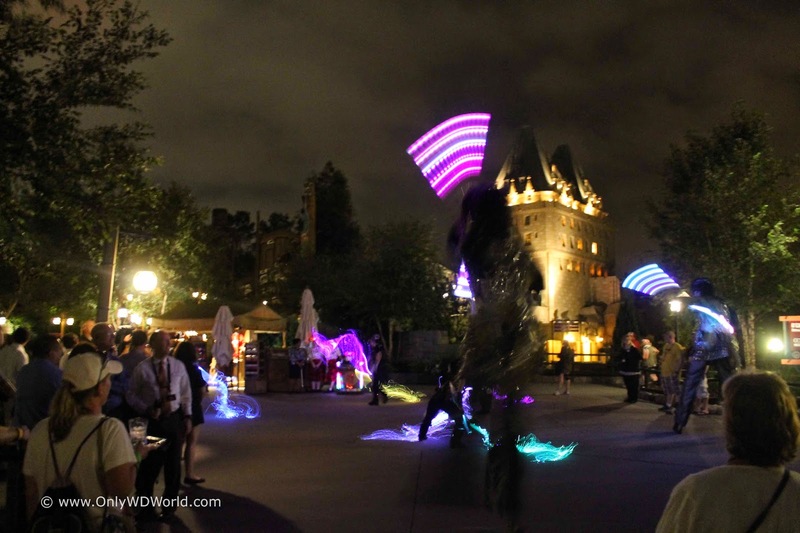 A combination of Food & Drink offerings from the Food & Wine Festival and special entertainment in a less crowded late night setting provided the framework for this event. Roughly 1/4 of the World Showcase was used for this event spanning from the main entrance to the World Showcase to the United Kingdom Pavilion. This included the F&W kiosks for Hawai'i, Deserts & Champagne, Greece, Canada, Ireland, and the Refreshment Port. 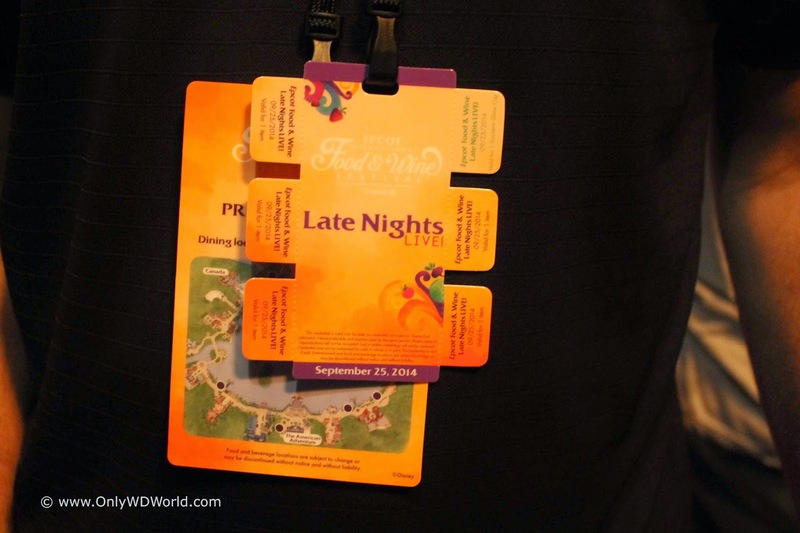 Each participant was given a lanyard that was not only their entrance ticket, but it also included 6 detachable tabs that could be redeemed for virtually any item on the marketplace menus. 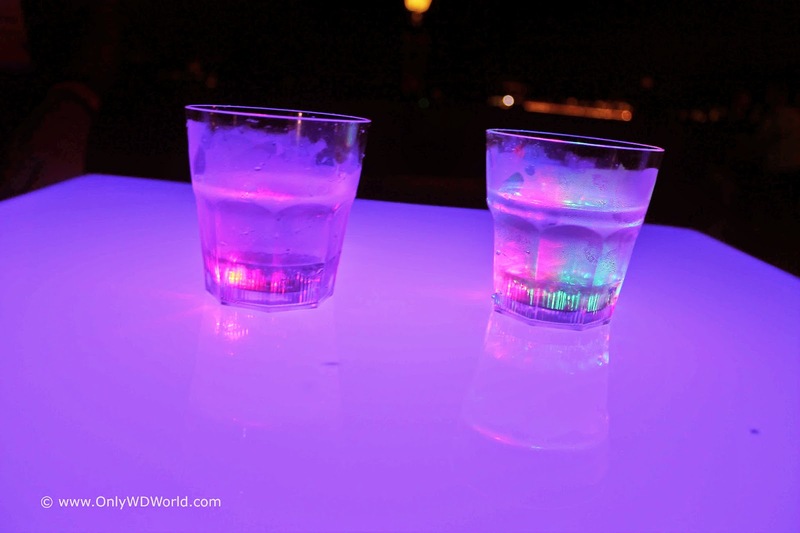 One of the tabs was special in that it could be redeemed for a special glow cup filed with a White Cranberry Cosmopolitan Concoction that was tasty and a great way to kick off the party. If you weren't interested in that you could redeem that tab anywhere for a food or drink item like the other tabs. All of the food stands were well staffed and lines remained relatively short throughout the event, keeping wait time to a minimum. 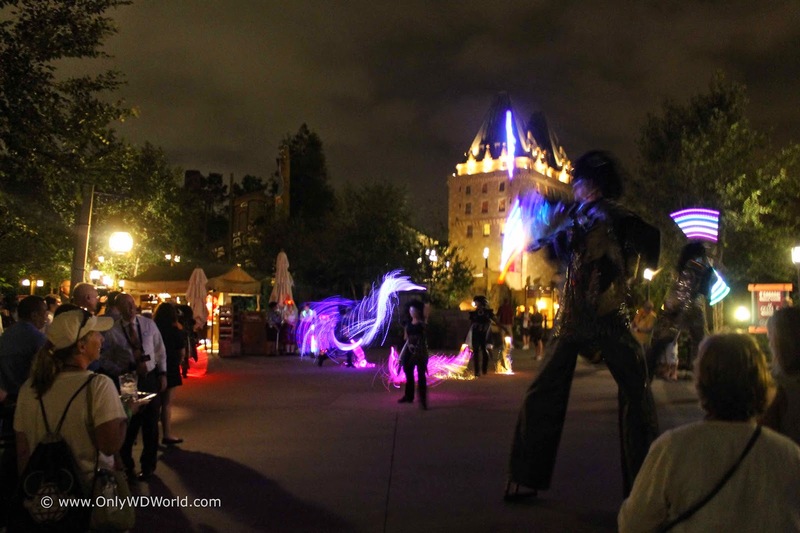 It was a relief, especially if you have ever experienced an Epcot Food & Wine Festival crowd on a weekend night. There were no such crowds during this event allowing for a relaxed enjoyment of the evening with the wonderful surroundings. 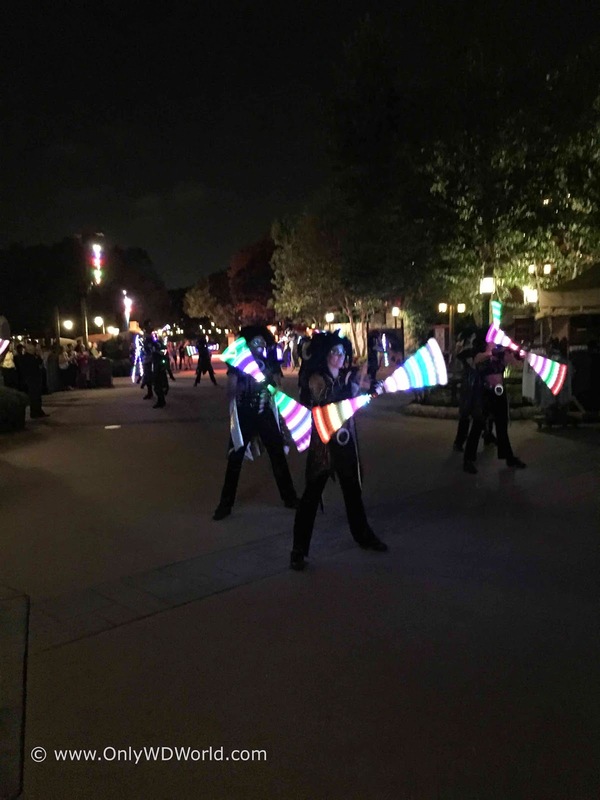 There were three different entertainment zones set up during the event that provided a wide range of entertainment options in an attempt to appeal to the wide demographic of attendees. Inside of the World Showplace Events Pavilion that was also opened up for this event was a live band called: Martini Pop. 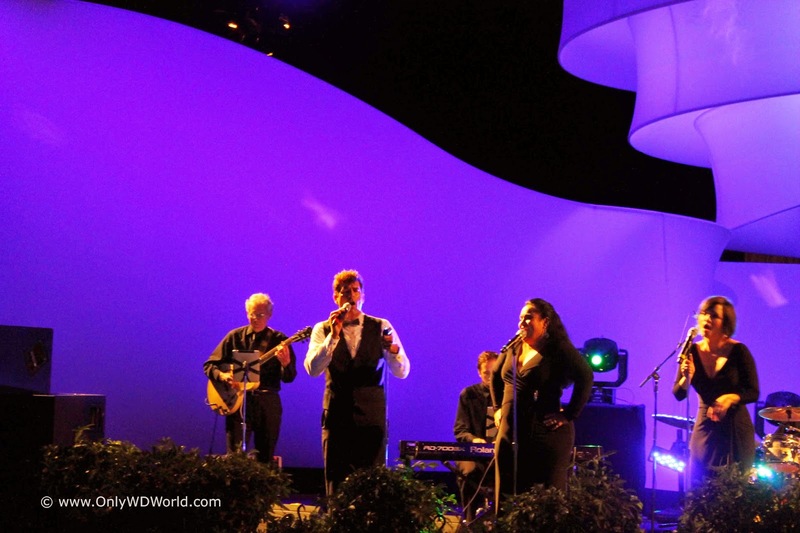 They sang a wide variety of popular hits in their own lounge style that was very entertaining. 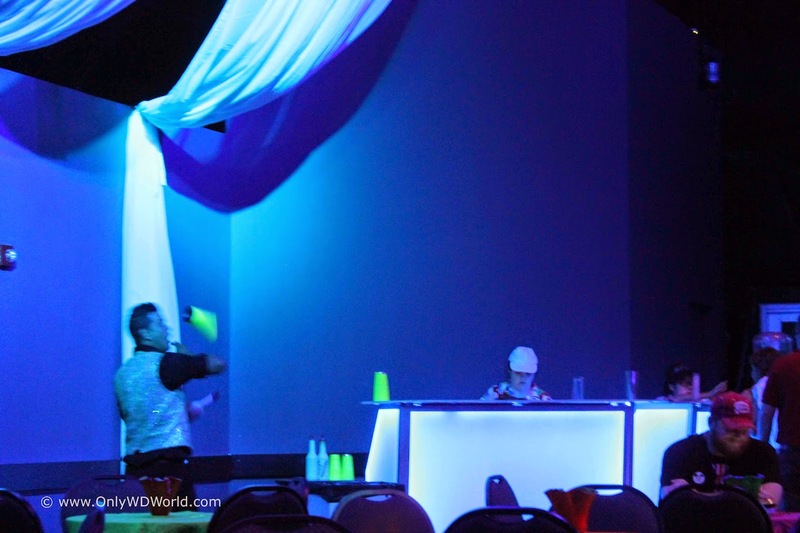 Also inside the World Showplace was a bar that was set up and two juggling bartenders that were there to entertain guests. 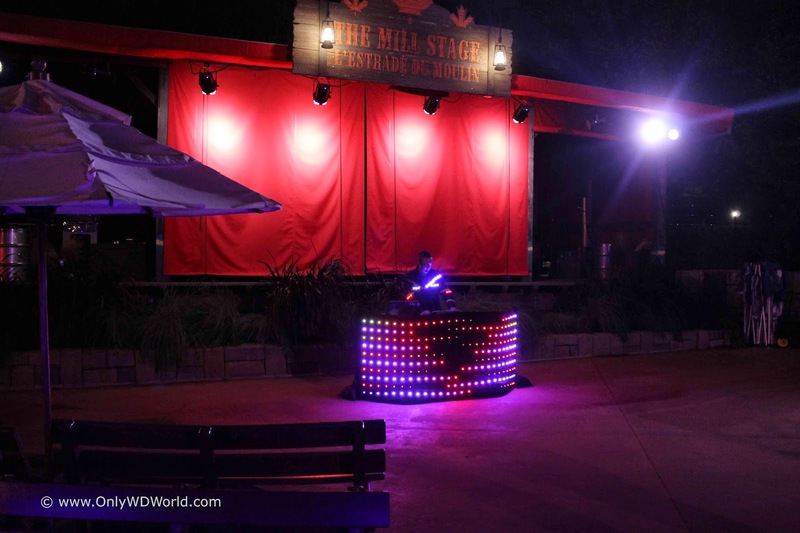 The next entertainment area was set-up in front of the Mill Stage in the Canada Pavilion (home of Off Kilter). Here a DJ was pumping out the dance music. Unfortunately most of the night the DJ was pretty lonely. The crowd, although ranging from 21 year olds to seniors, did not really appear to be in the dancing mood. 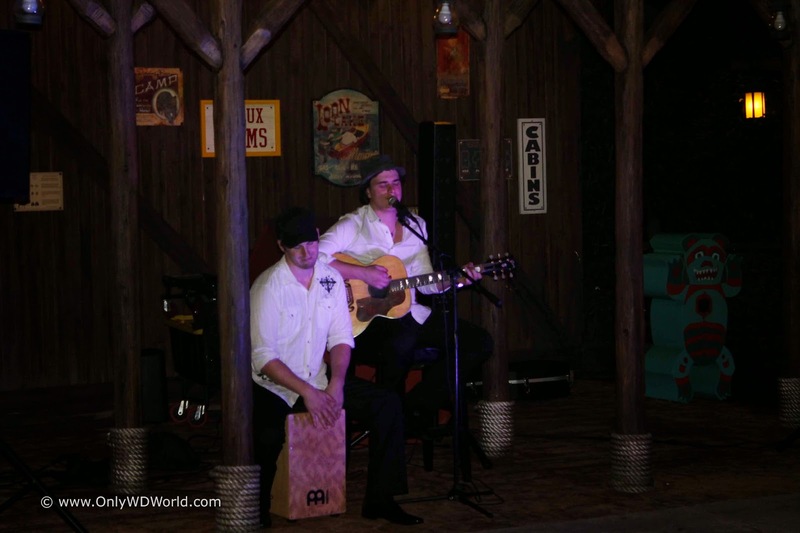 The last musical entertainment act was a guitar/percussion duo with a singer named Brian that was in the DVC booth area near the Canada Marketplace. He was playing an acoustic set and sounded great although the crowd typically was transient moving from location to location versus standing still to take in the entertainment. The biggest surprise of the evening was the special entertainment that came out at a couple of different times during the event. 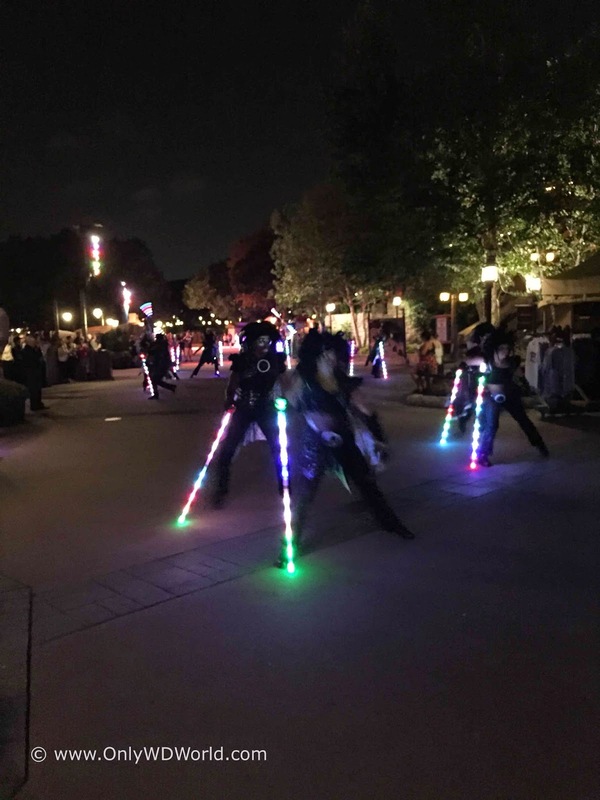 It was a troupe of costumed dancers with glowing sticks and LED whips? that performed to high energy dance music that was pumped across all of the speakers across the whole area. The costumes contained what appeared to be ram horns on all of the dancers and although they appeared to be having fun, most guests were not sure what to make of them. It was entertaining, but not sure how to described them or understand how they fit in to the event, other than providing a "Never seen that before!" moment. Review Summary for Late Nights Live! The Late Night Live! Event delivered what it promised: An after-hours event at the Epcot Food & Wine Festival that provided the opportunity to enjoy the Food & Drink from the Festival in a relaxed, non-crowded setting. The entertainment reviews are mixed. I am not sure that the DJ or the dance troupe really fit in with the event. Another acoustic performer, perhaps like the guitar player that has been performing in Brazil during the day might fit in better to the mood. Most of the guests appeared to trend to enjoying the food, drink, and discussions, as opposed to looking for a dance party. For a first attempt I though it went well, and should only improve as it moves through the following weeks. Disney World had a large number of support staff visibly there observing the event to see how things were going and to make sure it went smoothly. 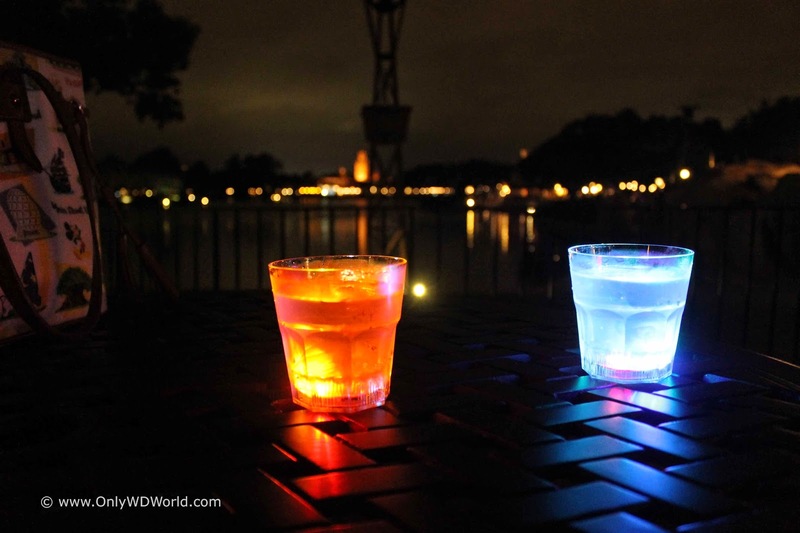 1 comments to "Review: Late Nights Live at the Epcot International Food & Wine Festival"
Can you purchase drinks if you choose to use your 6 tabs on food or vice versa?